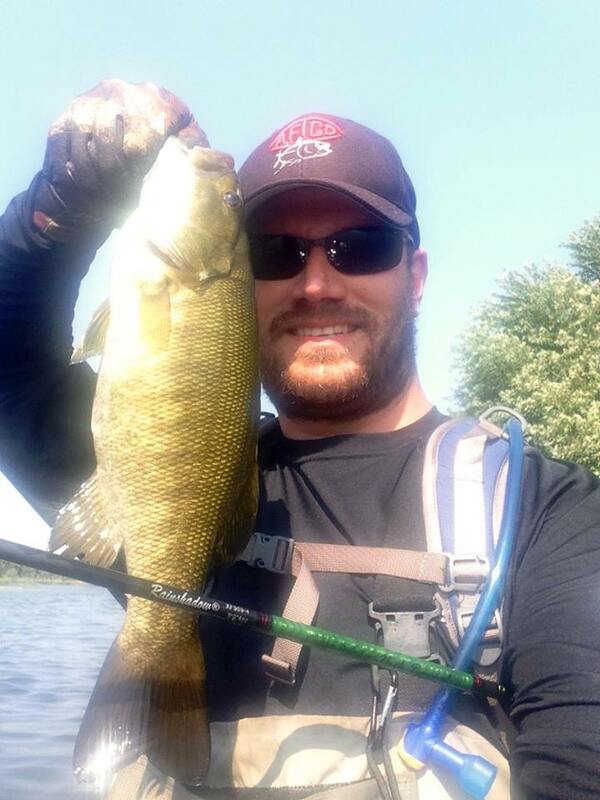 Like the weather, smallmouth fishing on the Des Plaines just keeps heating up. By one in the afternoon on Sunday, I was in the water and heading to the stretch of the river where I left off last time out. There were a series of small islands downstream that struck me as promising so I really wanted to check those out. I started off with an ugly looking fly that out of the water, and according to Ed from FSA Custom Rods, looks like a pile of belly button lint on a hook. He of course hasn't seen it in the water where it really takes shape and has some incredible action. The fly absolutely got the attention of the fish but only a few really tried to inhale it. The rest seemed to be only tail grabbing it and missing the hook. I'll be adjusting hook location on the next prototype. With more missed strikes than I cared for, I switched to a chartreuse over white clouser and that was all it took. I didn't keep count this day because I simply forgot but if I had to quantify the number of fish landed, I would say.....a lot. There didn't seem to be a "key" element for finding fish today which I found rather interesting. It would be easier to say where the fish weren't rather than where they were. If the water was fast and shallow, the fish weren't there. Aside from that, they were everywhere. Shallow and deeper slack pools alike had fish. Mid river under steady current had fish. I found them in open water and I found them hiding in patches of grass. They were truly everywhere. I'd find a spot that looked like there might be a fish, cast, strip the fly back a little bit and I'd have a fish. Do this three, four, ten more times and when I came up empty, I would move about fifty feet and start over. It seemed that the first fish in every new section would be the biggest one there. It was as if there was some sort of pecking order - the biggest of the group got the first crack at it and then it was the smaller fishes' turn. This held true almost every time I moved. The good news about smallmouth is that big or small, they fight like all hell so I fished every spot until I came up empty on three consecutive casts. If I went more than three casts without a bite, I moved. As far as presentation is concerned, it seemed to be just as unspecific as the water conditions they were in. Upstream retrieve, downstream, across, fast or slow all caught fish. If I had to pick one as a winner though, I would say that a slight upstream and across cast with a strip strip pause retrieve seemed to be the most productive. It helped the fly sink a bit deeper than if you were to cast downstream while a straight upstream cast seemed to be too deep for them. As I said before though, I caught fish in every direction. Of all the fish caught though, there were two clear winners for the most exciting award. They were the biggest of the day but that's not what made them so memorable. Instead, it was the take that made them so memorable. The above fish was a "one more cast" fish. As I was putting my fly on the hook keeper before starting the mile and half upstream walk to my truck, I noticed a huge swarm of bugs on the water under the shade of a large riverside tree. I saw a couple of boils as fish were obviously gorging themselves on these bugs and I just had to give a shot. I stripped almost the entire length of fly line off the reel because this spot was very far and there wasn't an easy way to get closer. After a couple of false casts to get the rod really loaded up, I delivered the fly perfectly in the middle of the swarm. Almost as soon as it hit the water, a huge blow up ensued with a fish coming completely out of the water with my fly in its mouth. I strip set the hell out of that thing and it was game on!! The rest of the fight was fun since I had a lot of line out, river current, and a 16" smallmouth at the end of it all but it was that explosive take that really had me pumped. The fish below was the biggest of the day at 17" and another incredibly exciting take. I had just moved to a new spot and delivered a down and across cast just past a small shelf where it went from about a foot deep to about three. As the fly swung past the edge of the shelf, a clear dark shadow instantly appeared about three inches behind. It stayed right behind it the entire duration of the swing until the line was directly downstream of me. As the fly stopped swinging, it just sat there..stalking...waiting...studying. I slowly pulled in about a foot of line and the fish followed but still wouldn't bite so I went with the old "take away" approach at that point. I grabbed about three super fast foot long strips and the fish rocketed towards the fly and absolutely inhaled it. Quick strip set and that fish went air born. Absolutely stellar watching this thing stalk its prey. The Smallie' from the last paragraph is absolutely why I love fishing for Smallies'. 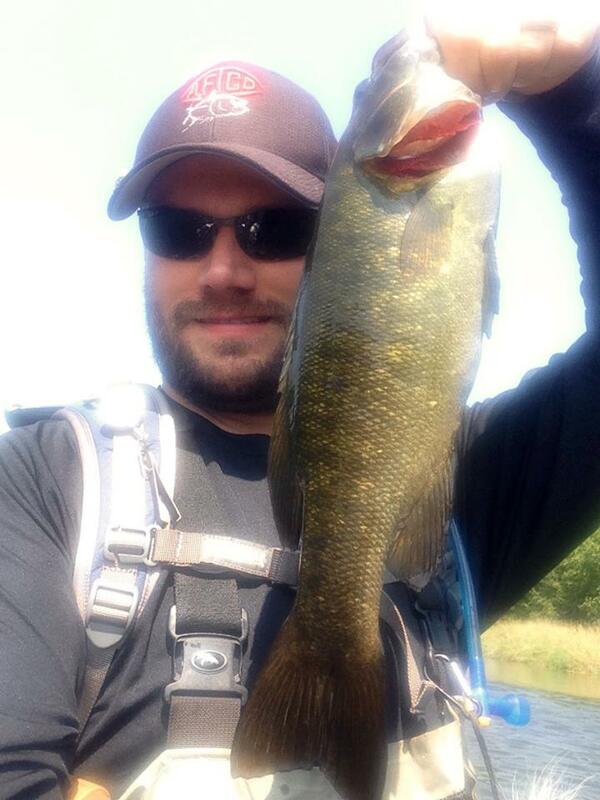 You pay your dues, and, the Smallie will repay you with a terrific battle. Happy that you are really enjoying your stretch of the river. Can't agree more, Mel. I am absolutely loving the fact that fishing like this is ten minutes from my new house. Very nice looking fish. Bass love ugly flies. Let us see the next prototype. I got a fuzzy rabbit strip that looks like junk out of the water but in the lake it rarely fails. I'll be tying up a couple more in the next few days and will get a few photos up. Great looking bass! Very nice.